I don't always get to preach but I always get to listen to a homily, often more than one. This week I was chatting to a good friend about the homily she was preparing and was really interested in what she was preparing. She is a great preacher and has kindly agreed to let me publish her work here. I am particularly grateful as this weeks gospel follows on directly from last weeks, and I think this homily is a good lesson for us all and follows on well from my homily from last week. So here is Christine Butler's wonderful homily on this Sunday's Gospel. If you have any comment's please let me know and I'll make sure they get get back to Chris. Many of us are not happy about talking or thinking about judgement and end times, it seems to have gone out of fashion, a bit too uncomfortable maybe, but today's reading asks us to do just that and it is not something we should shy away from debating and discussing. This is the second parable Jesus told using a pastoral theme – because Jesus knew his audience, many of them would have been workers in the field and would totally understand the example – but maybe not so much the meaning. Unlike the last parable of the sower there are 2 sowings in this parable, the good wheat sown during the day by the good sower and the bad weed which is sown under the cover of darkness when all were asleep, by his enemy. Both grew up together and were not distinguishable from each other. 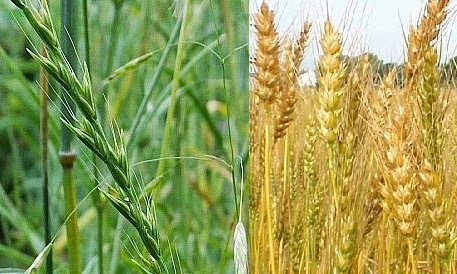 It is likely that the weed was Darnell, weeds that at first looked just like wheat and were impossible to separate until the ears of the wheat appeared – just as we cannot always tell good from evil until the fruit is seen. Darnell is poisonous and leads to symptoms of drunkenness and possibly death if ingested, but it is not a disaster, it won’t ruin the whole crop, there is hope. Jesus says the weeds will be collected and ultimately be destroyed before the good grain is harvested. The weed will be burned, evil will be defeated and removed. Only then will the good fruit be harvested and stored. We do live in an imperfect world and we can’t prevent that, we can’t rid the world of evil, indeed we cannot always see which is evil. If we watch the news how many of us can understand the crisis in Israel and Palestine, people try and blame one side or the other and declare that they are evil, but the conflict is so deeply rooted how can we decide who is the protagonist and who the defender, who is wheat and who the weeds. If we look closer to home who can claim our church is perfect, it is not the shining example we would wish to be, nowhere is, but Jesus is making it clear it is not up to us to judge, whether that is world issues or things happening in our local church. But we can live as faithfully as possible and produce good fruit, Jesus promises there will be a harvest, evil must pay the price for it actions. So this parable is not comfortable but it is an important reminder to continue to produce good fruit, Jesus promises hope for the future, the harvest is secure. WE can trust the Jesus is good, our king and continue to follow him but we shouldn't try and tame him as Mr beaver says in the Lion the witch and the wardrobe when Lucy asks isn't Aslan safe. We can trust that Jesus is good, the king, our role is to follow him, produce good fruit and continue to trust.